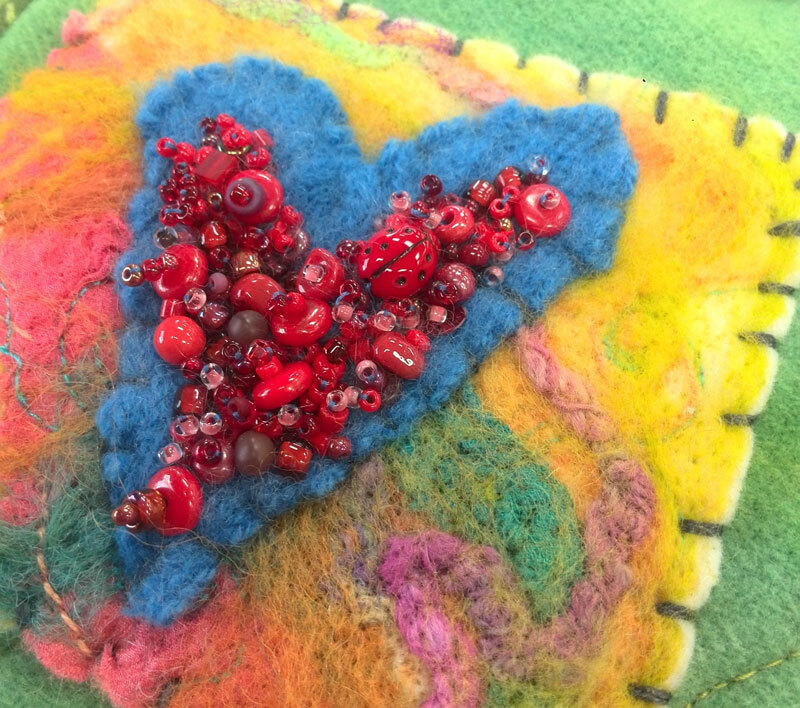 It’s Friday, April 12, Artistic Artifacts’ day to celebrate the publication Beaded Embroidery Stitching: 125 Stitches to Embellish with Beads, Buttons, Charms, Bead Weaving & More by Christen Brown! Please comment on our posting of this blog tour — use the field at the bottom of the page and be sure to include your email address — to be eligible for our random drawing to win an e-book copy of this beautiful book from us! 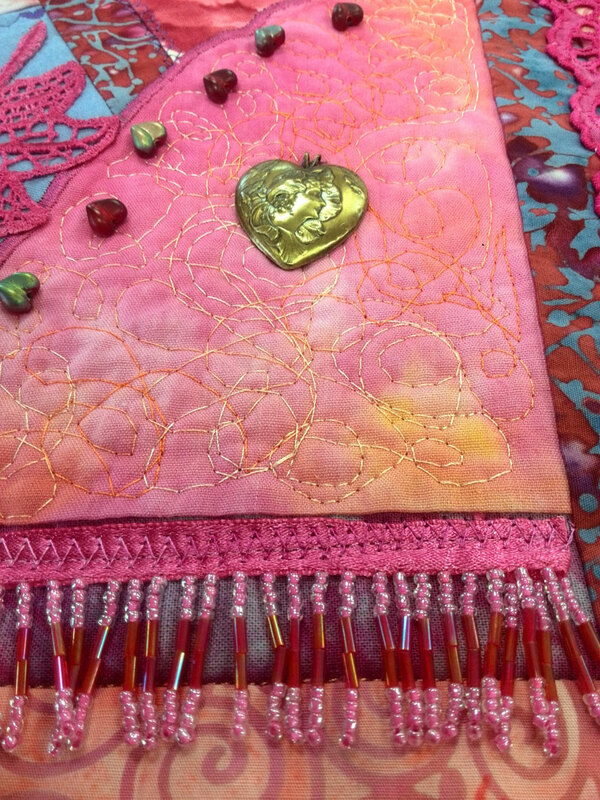 I have long been a fan of beading and have often incorporated it into my art quilts (you can visit past blog posts here and here for some examples). 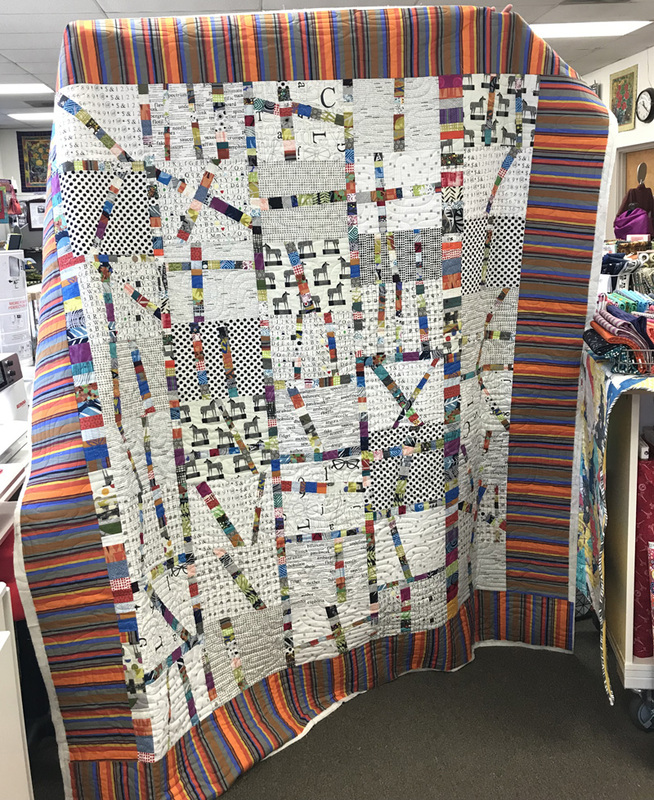 When Artistic Artifacts was selected as a 2018 Top Shop by Quilt Sampler magazine, our magazine exclusive project was a batik panel quilt with beading! 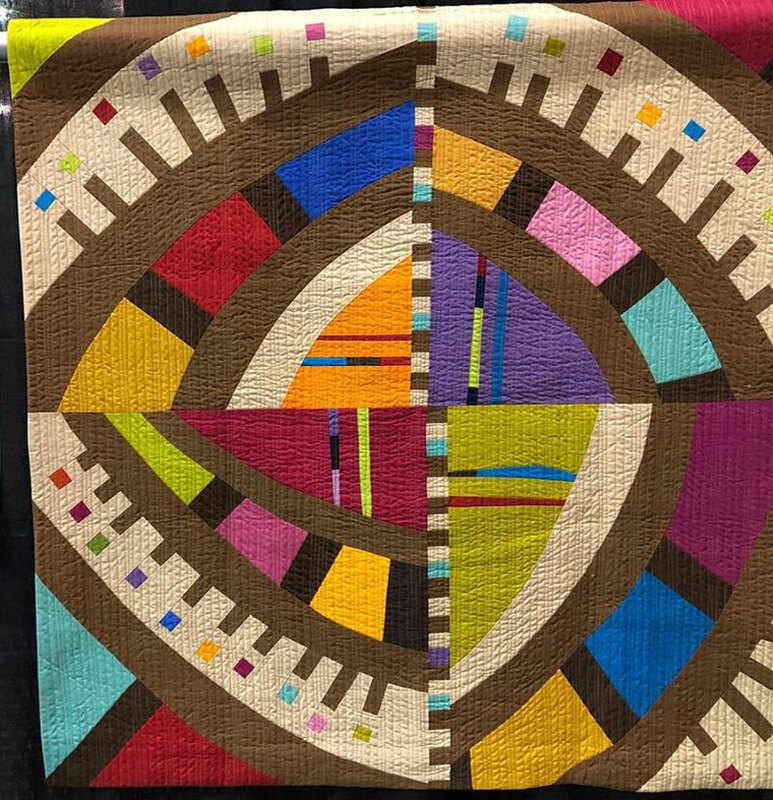 Our Artistic Artifacts Quilt Sampler kit is available in several colors and includes a Hari Agung batik panel, coordinating Australian Aborigine Designed fabrics and our own Batik Tambal Exclusive Batiks, plus beads, Silamide thread (my favorite) and a needle to embellish! Beaded Embroidery Stitching from C&T Publishing features 125 bead embroidery and bead woven stitches, and readers can search both stitches organized by type with a complete visual guide or the A-to-Z stitch index. 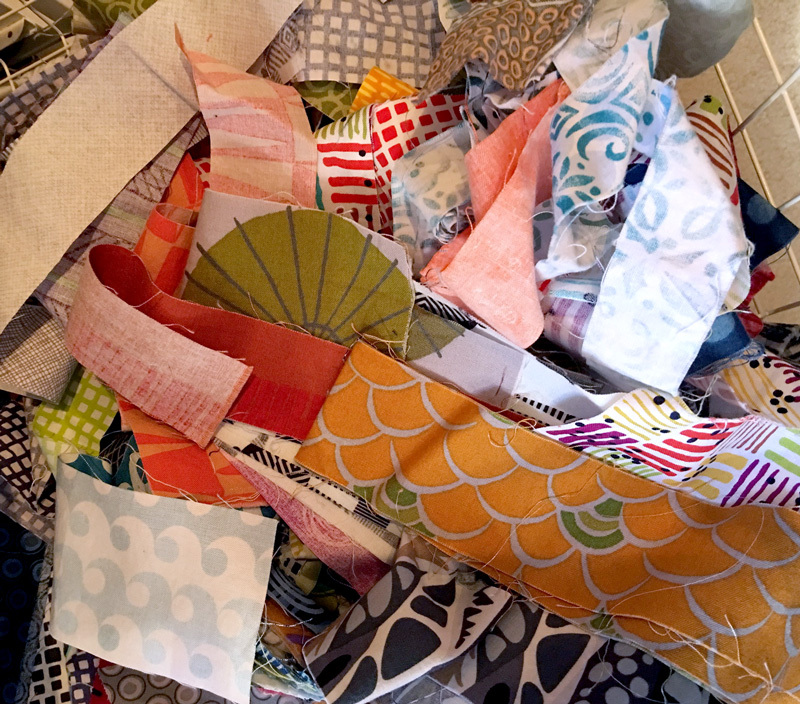 There is a wonderful assortment of beautiful dimensional stitches that I thought would be perfect for my project. 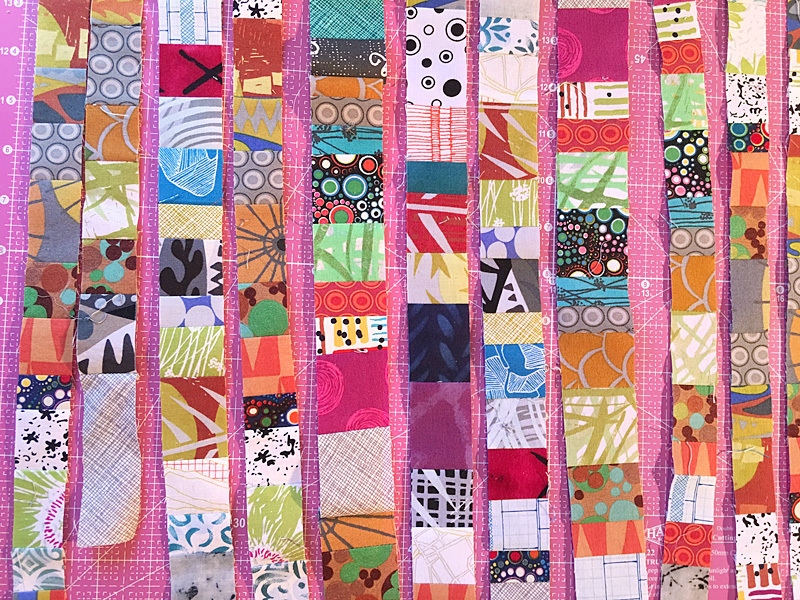 Above, my quilted batik panel quilt before I started beading. 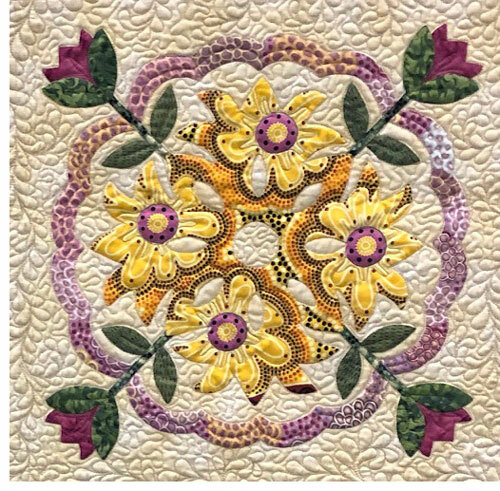 The center floral panel is another from Hari Agung. I gathered my other supplies, beads, beading needles (Tulip brand, which are in my opinion the best quality), a beading awl (useful to reposition beads or clear the hole of coatings so your needle can go through) and Silamide. 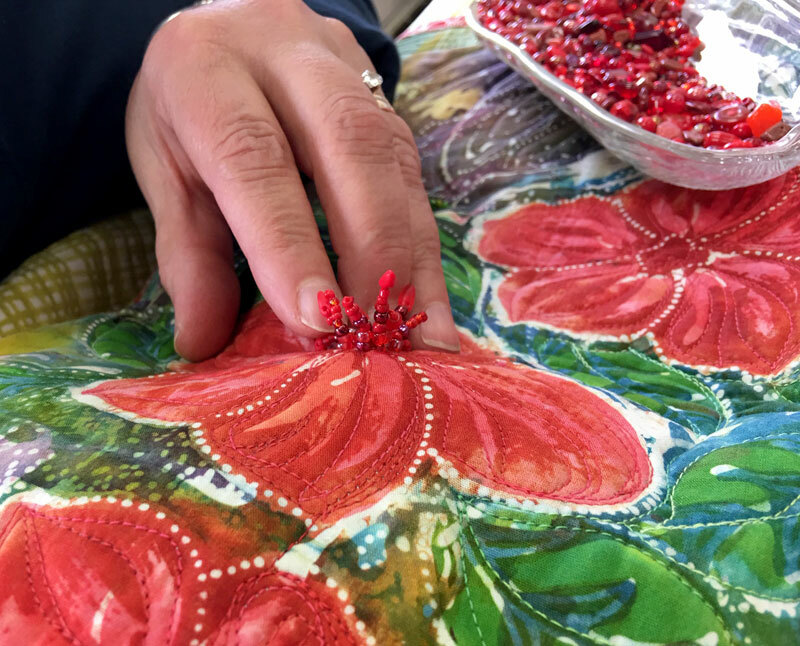 An obvious choice when working on a batik panel featuring flowers was exploring Christen’s Beaded Pistil Stitch. I enjoyed learning this technique and am thrilled with the dimension it adds! I wanted to try out her Feather and Fly Stitches to accent one of the leaves in my panel. 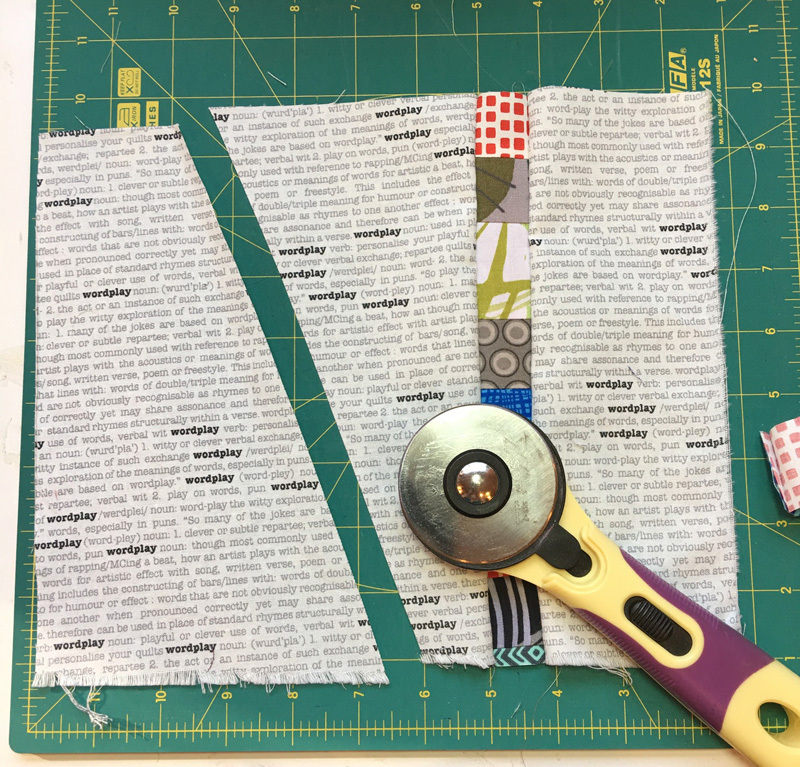 Despite Christen’s very clear instructions, my attempt went a bit awry with this one — I told you I was used to freeform stitching! 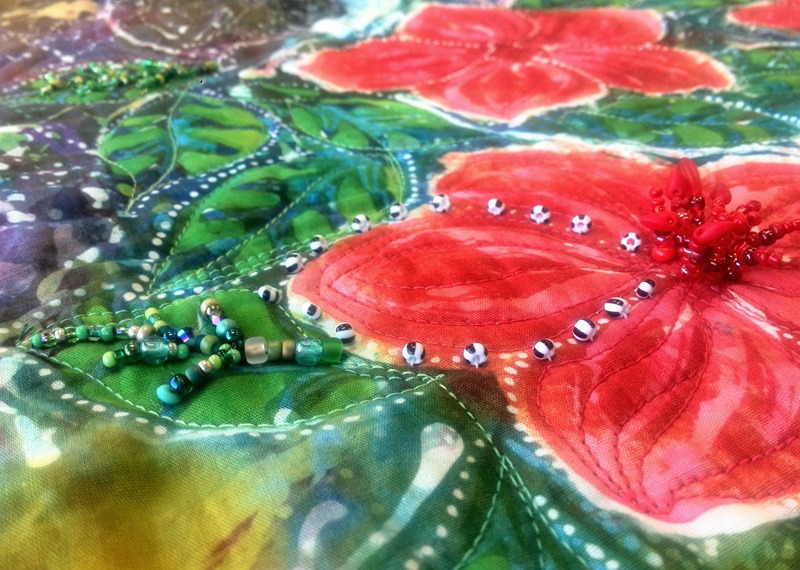 But even so, I love the way the bead embroidery enhances the leaf in my panel. 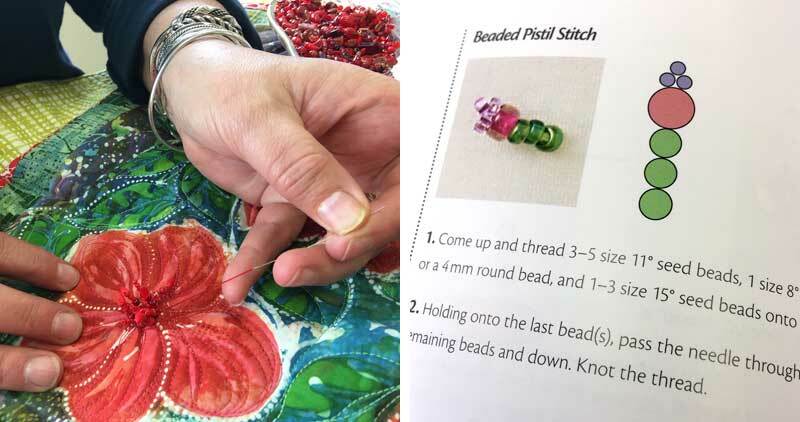 Christen begins her book with explaining, and illustrating, how beads come in many different shapes and sizes, with seed beads are numbered from low to high: the higher the number, the smaller the bead. 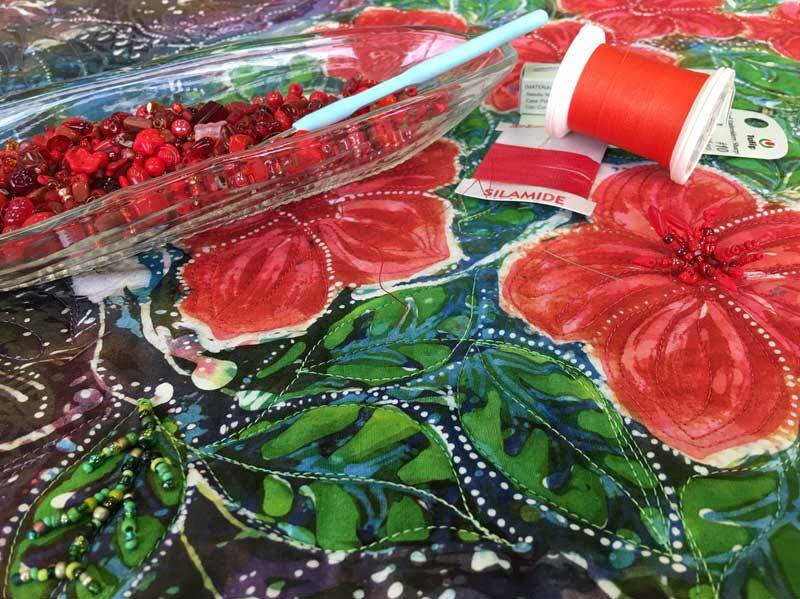 My preference is for mixing colors and sizes of beads together (that’s what you find in the Artistic Artifacts bead mixes I’m using here), but a uniform line of beads would also be perfect on my leaves. Above, I added tiny striped beads to accent the edge of the petals. 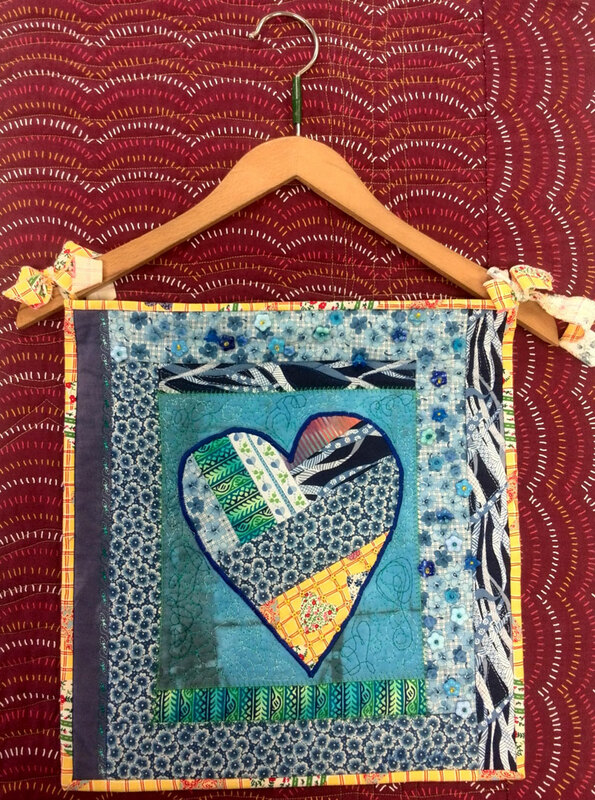 Anyone who knows me knows I am a huge lover of vintage beaded textiles and accessories, so I enjoyed learning more about how these influenced Christen’s work. 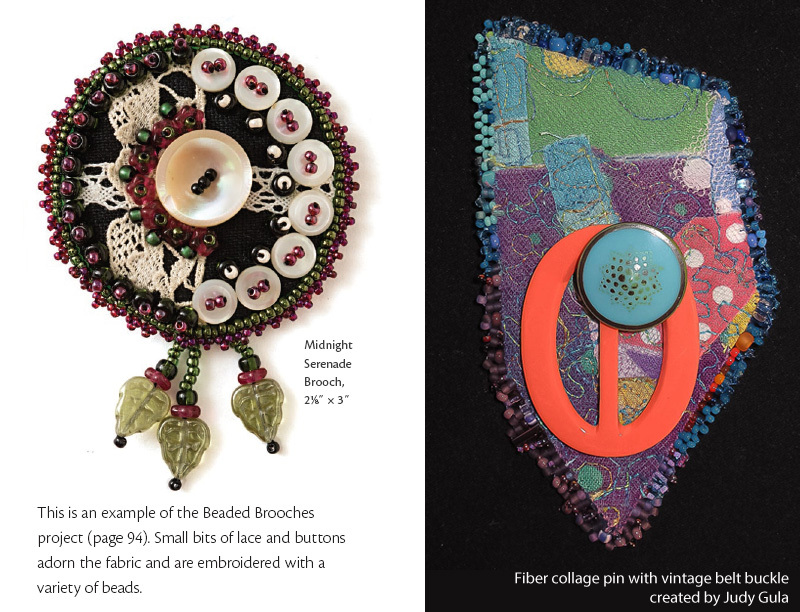 I used to create pins and brooches by the handful (see more here) so her Beaded Brooches project (page 94, one example above left) was of interest. 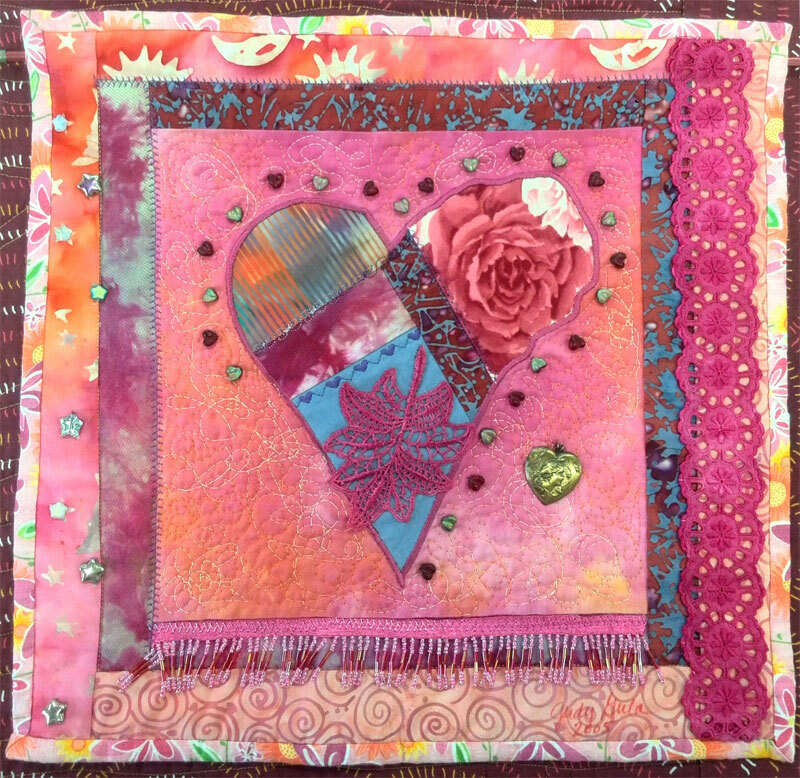 Beaded Embroidery Stitching includes instructions on creating beaded edges, which as you see are beautiful on dimensional shapes! I’m thankful to Diane Herbort, who often teaches at Artistic Artifacts — she and Christen are long-time friends and Diane recommended us to her for this blog tour. 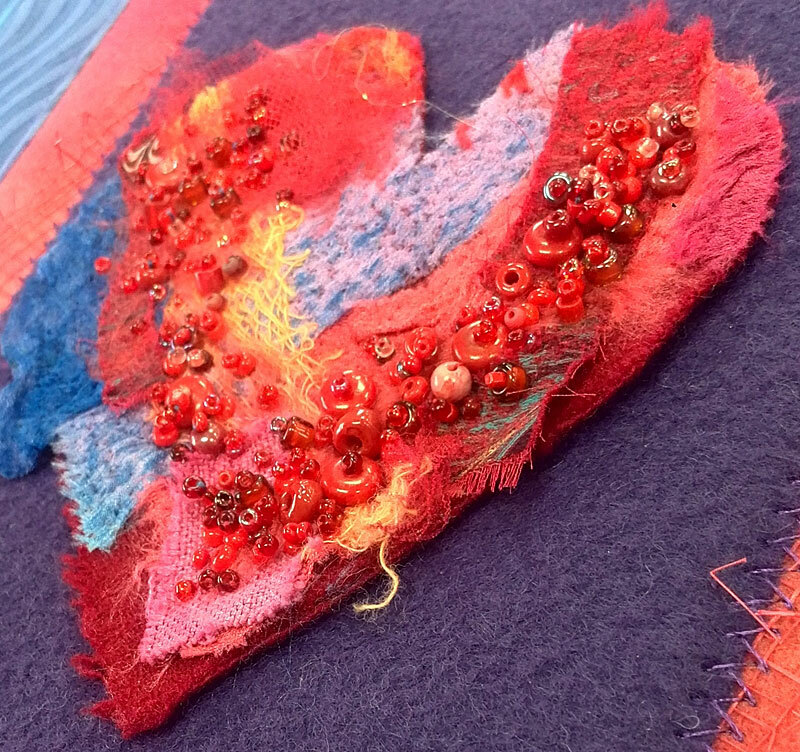 Beaded Embroidery Stitching is a resource all embroiderers, crazy quilters, craft sewists, jewelry makers and more will want to add to their library. I was interested to learn more about how Christen achieves her beautiful work, and this book didn’t disappoint. 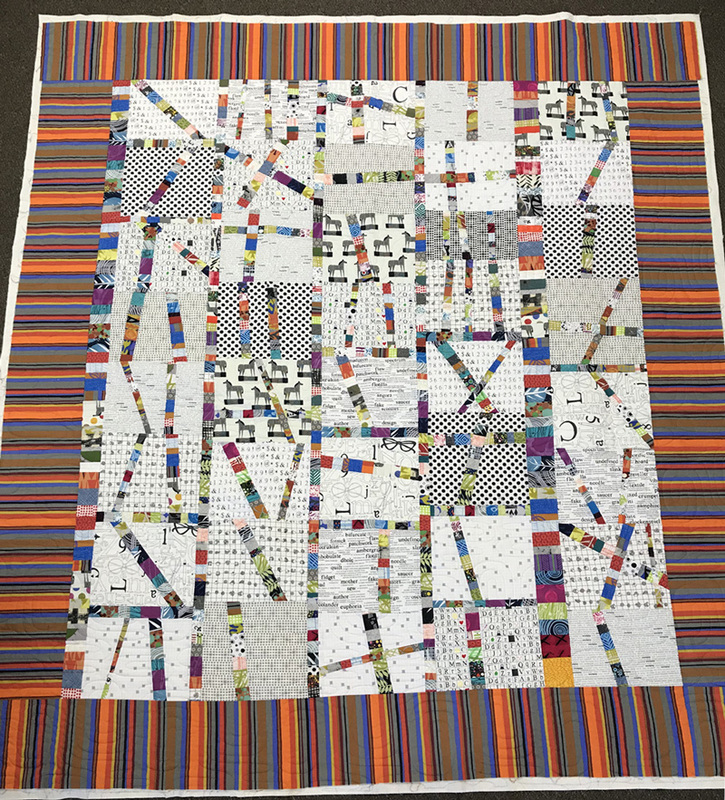 The plentiful photographs are truly eye candy, and each project includes clear instructions, plus a photo ‘map’ so you can see exactly what stitch is used where (example here). 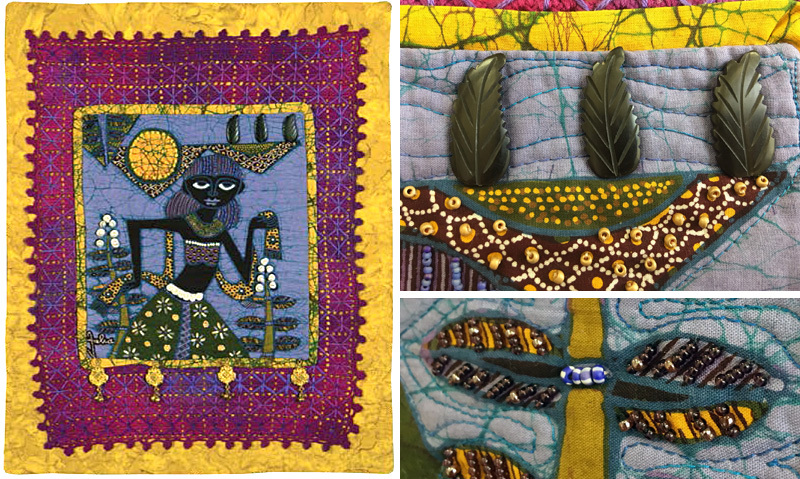 Below is the complete Beaded Embroidery Stitching Blog Tour lineup — please visit each blog each day to see their reviews, how they have been inspired, and more. Follow each blog’s directions for how to be eligible to win — if you aren’t our winner, you have several chances to be someone else’s! 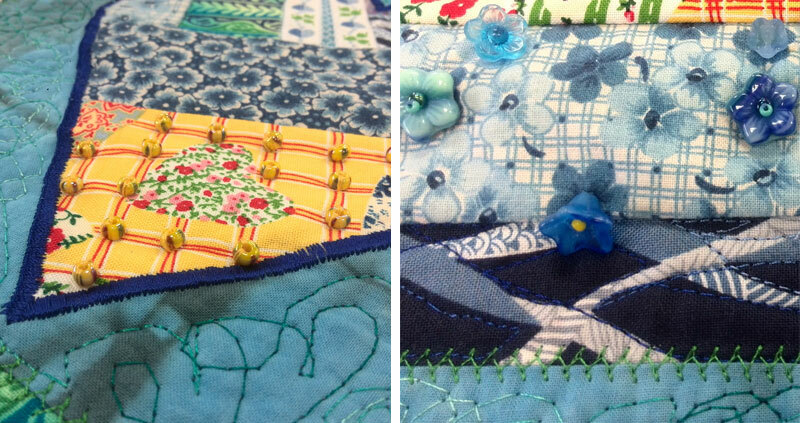 Embroidered and Embellished: 85 Stitches Using Thread, Floss, Ribbon, Beads & More. 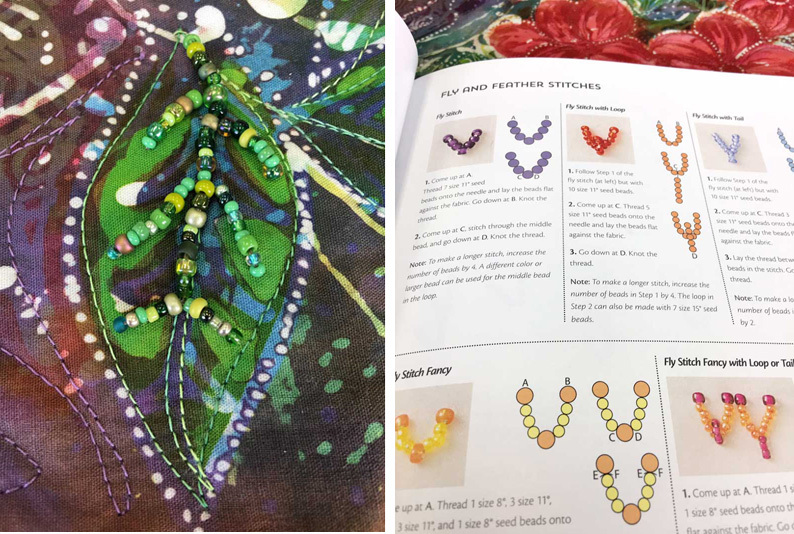 The complete visual guide to hand embroidery and embellishing and an essential embroidery reference for everyone from beginners to experts. 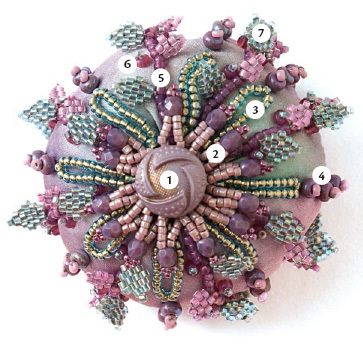 This richly illustrated reference guide from embroidery expert Christen Brown covers everything you need to make beautiful magic with needle and thread. 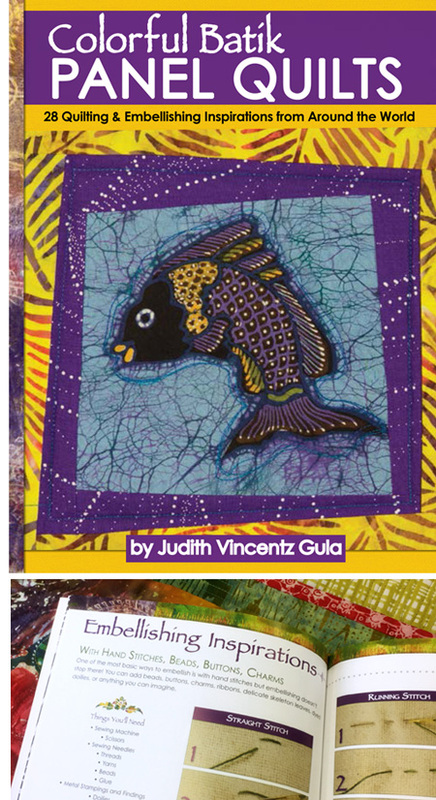 The Embroidery Book: Visual Resource of Color & Design. 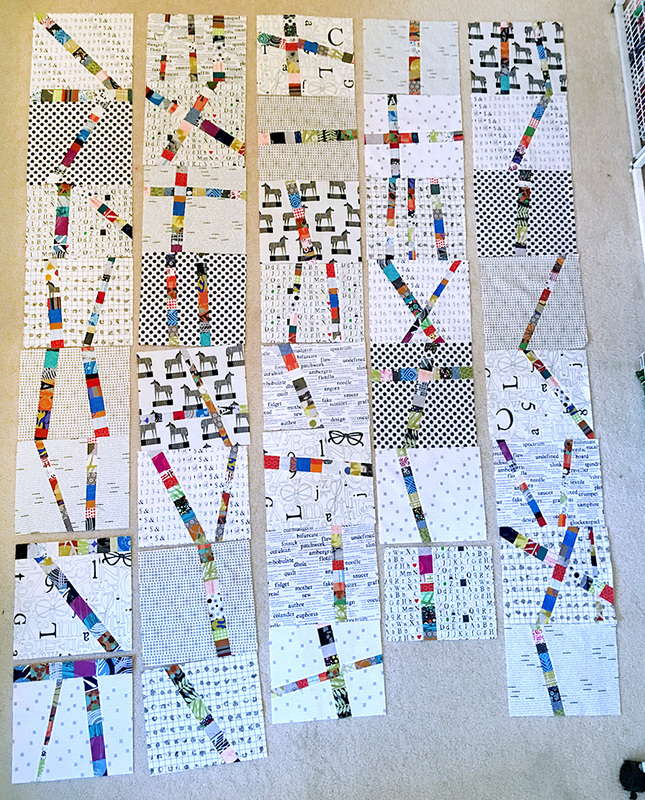 A step-by-step visual guide to 149 embroidery stitches, motifs, and extras with robust color charts that take the guesswork out of choosing thread, buttons, and trims. Stitch classic seam treatments and stunning stand-alone designs as you go beyond the basics to learn what embroidery can do for you. Embroidery Stencils, Essential Collection help you create unique designs to embroider: hearts, flowers, baskets, butterflies, spiderwebs, vines, feather stitches, and more using the 4 in. x 8 in. 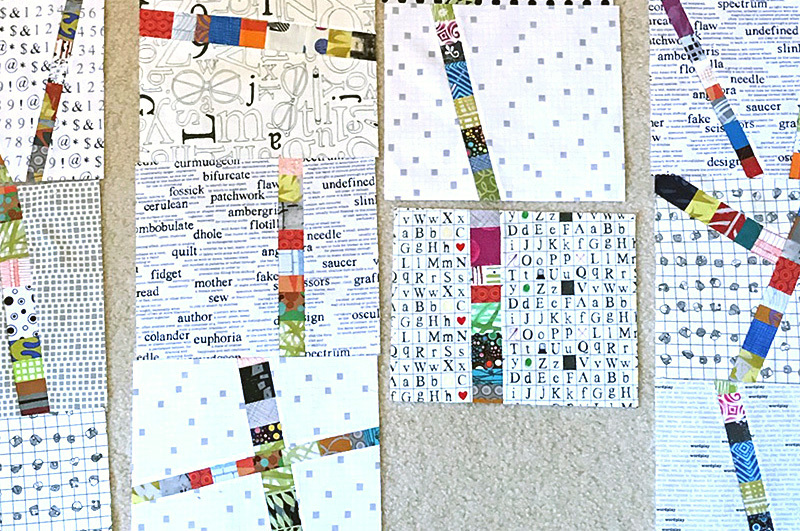 stencils that combine to create 90+ embroidery designs. 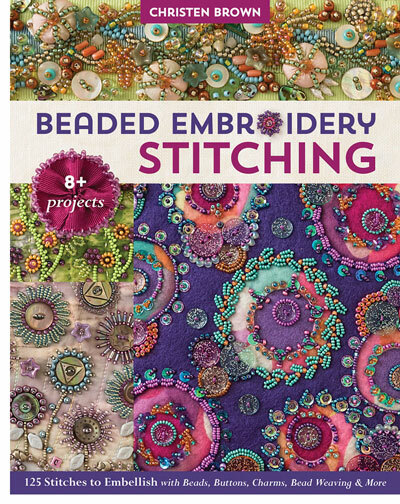 Remember, leave a comment and your email address to be eligible to win an ebook copy of Beaded Embroidery Stitching! Above, my supplies and tools are ready for my next beading session! 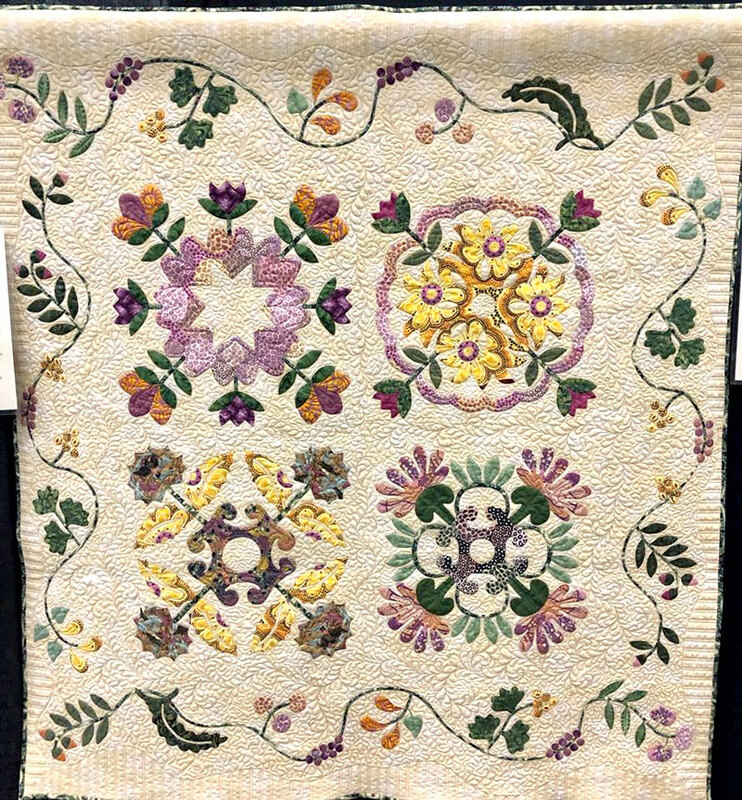 125 Stitches to Embellish with Beads, Buttons, Charms, Bead Weaving & More by Christen Brown, and we’re happy to be participating! Each day visitors have the chance to win their own e-book copy! 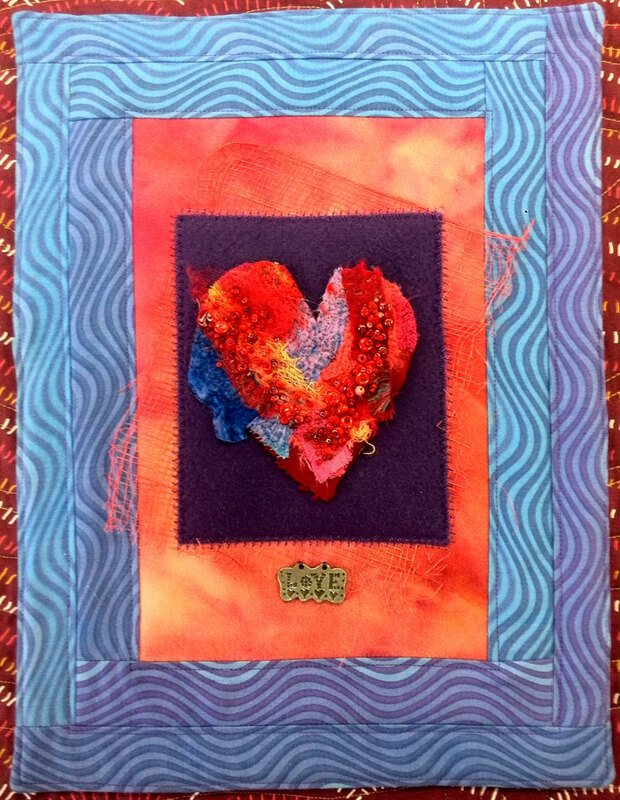 The blog tour kicks off today, Monday, April 8, 2019 with Christen sharing some of her background in fiber art as well as favorite beaded embroidered artwork on the C&T Publishing blog. 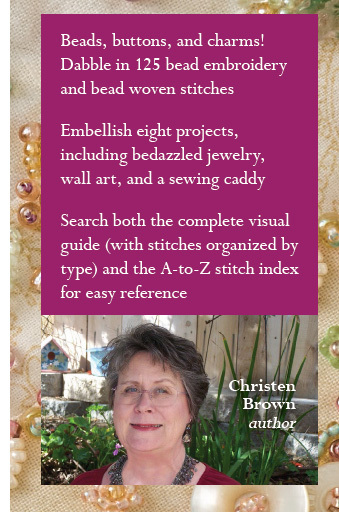 Below is the complete Beaded Embroidery Stitching Blog Tour schedule — please visit each blog each day to see their reviews of this book, how they have been inspired, and more. Follow each blog’s directions for how to be eligible to win — if you aren’t our winner, you have several chances to be someone else’s! 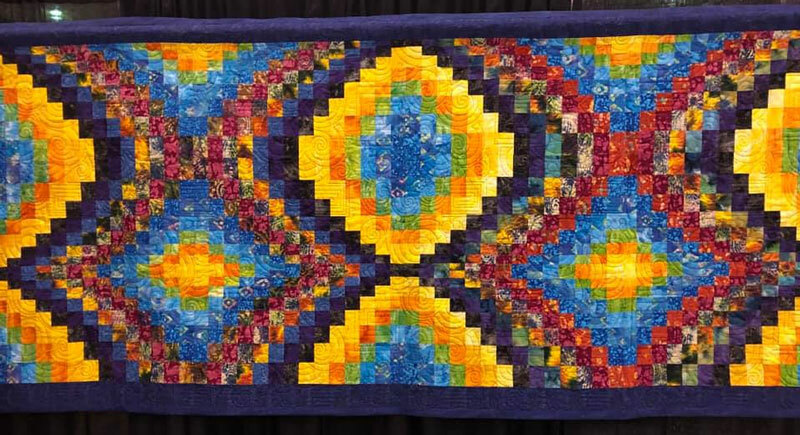 We always enjoy the Mid-Atlantic Quilt Festival — relatively close to home, and so many of our customers and guild members make the trip down. 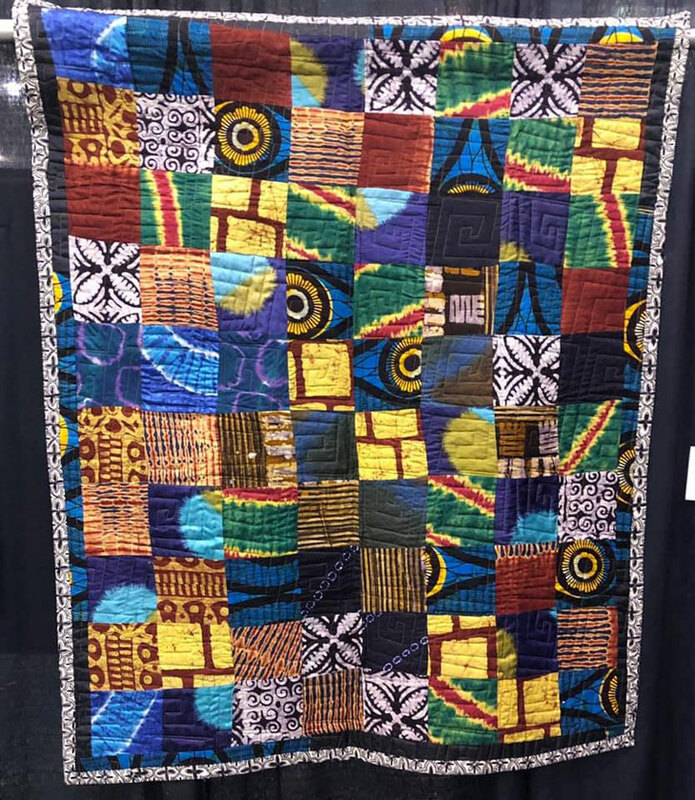 We received a lot of comments and compliments on my book Colorful Batik Panel Quilts and all the samples and products we had with us: thank you! 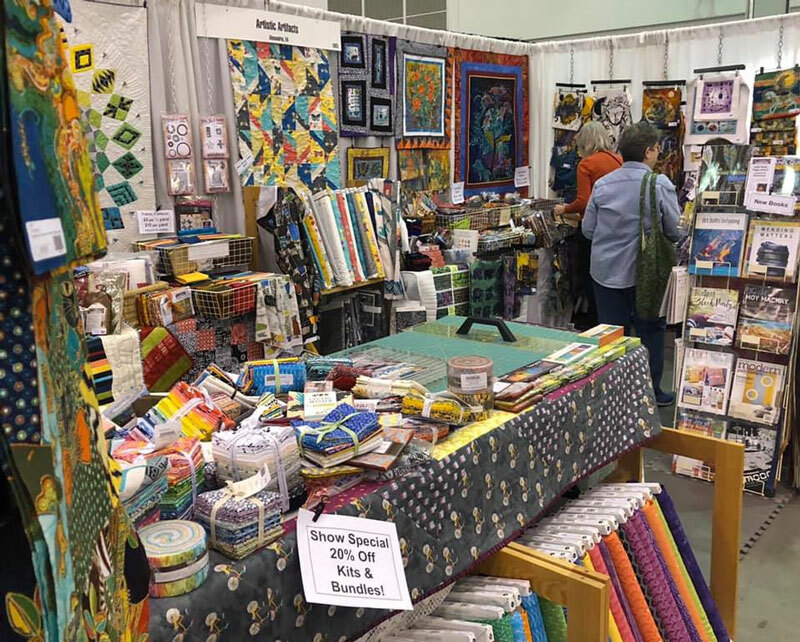 While we love being busy in the booth (pictured above), of course we hope to have a few moments free to enjoy the quilts! 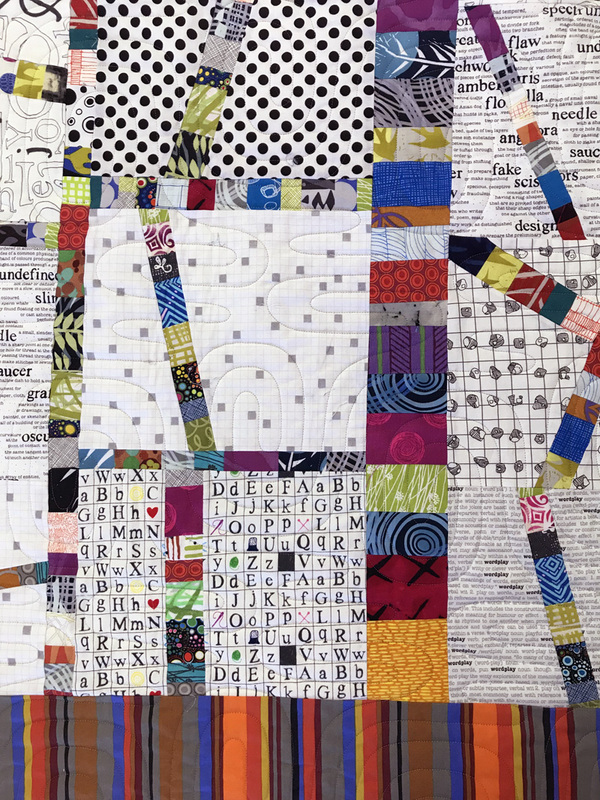 We were blown away by the hand appliqué work of Barbara G. Buchanan! Above, Mary Down Under No. 3. 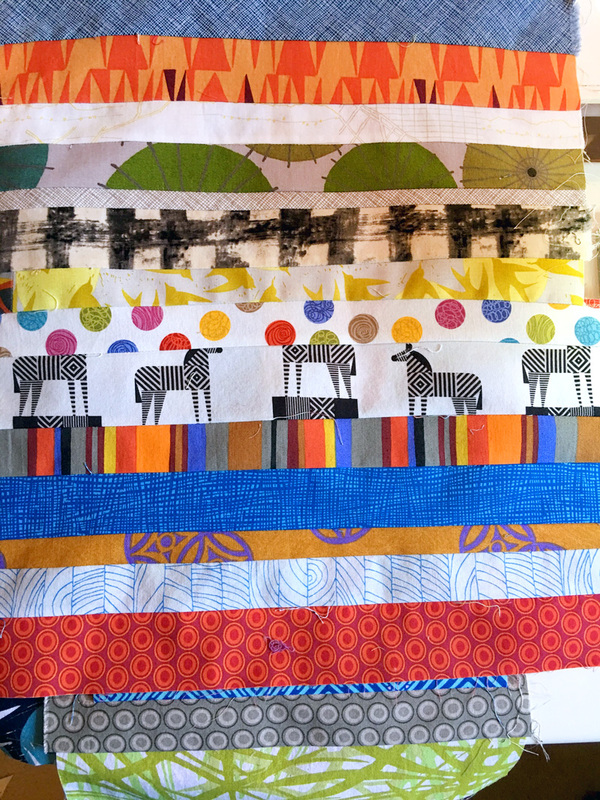 We’ve never seen Australian Aboriginal fabric used in this way! 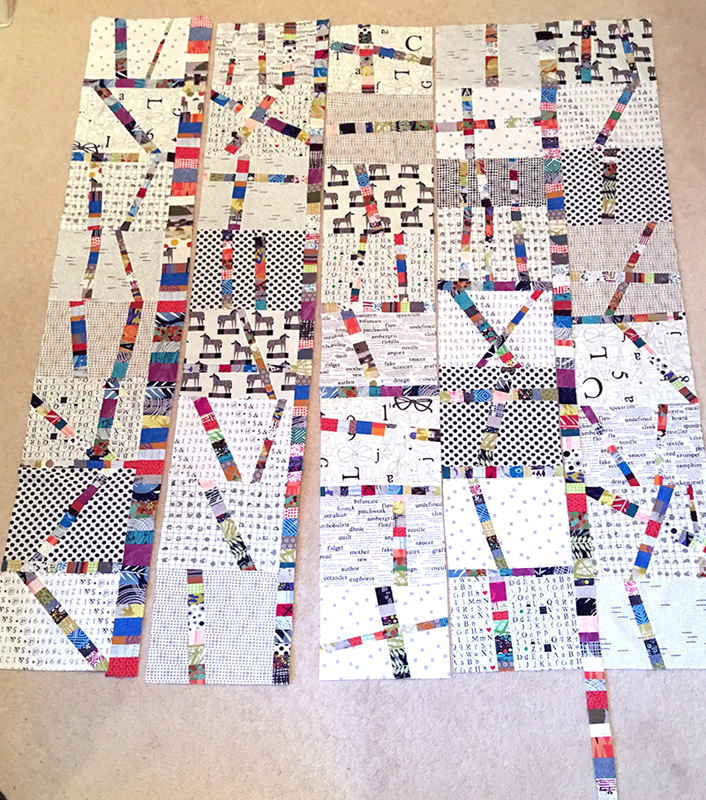 Both quilts are 50 in. 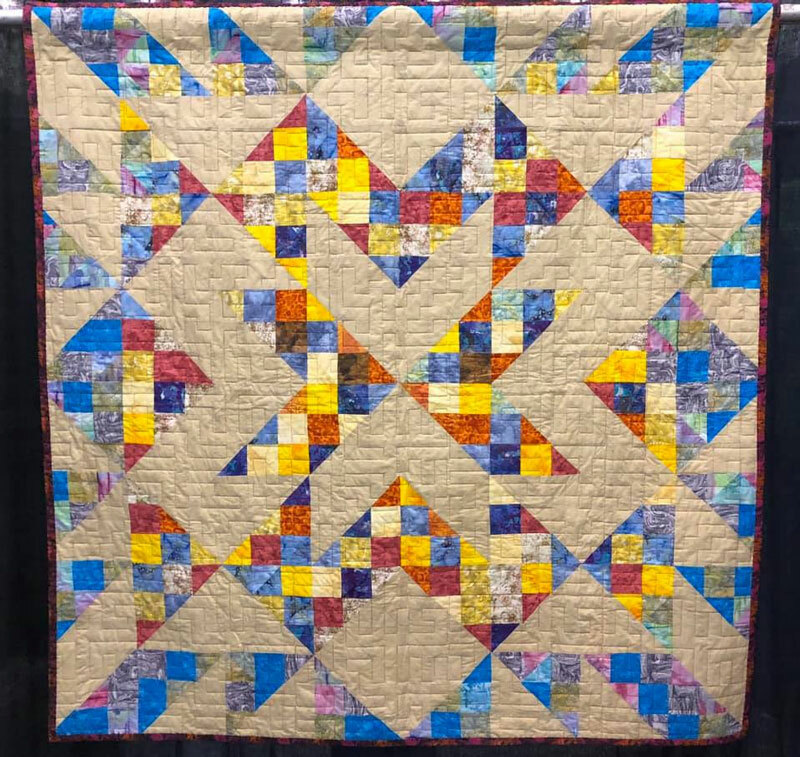 square and were expertly machine quilted by Maria O’Haver. 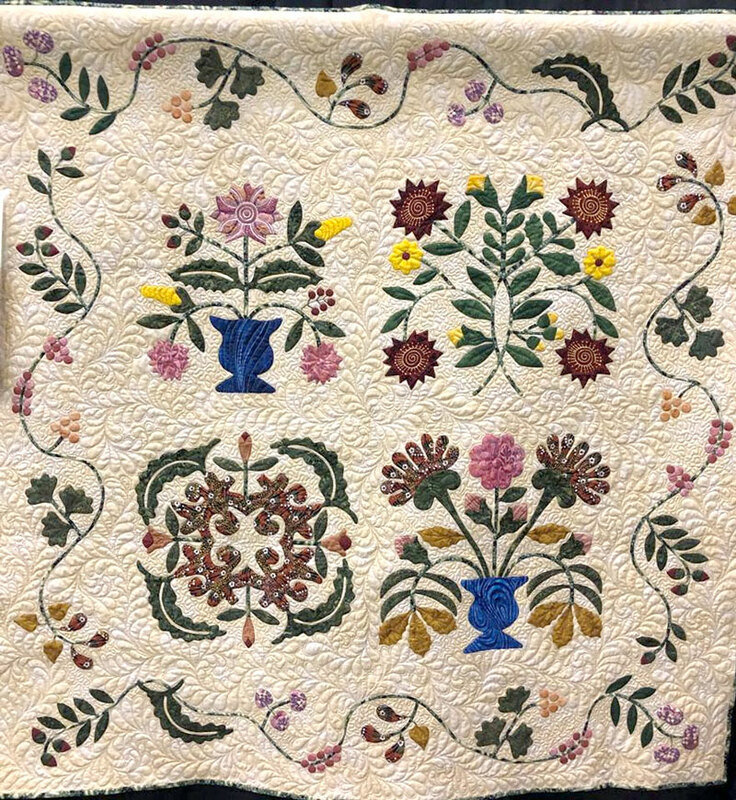 In this detail photo you can see the care in which Barbara framed the fabrics’ pattern to enhance her applique pieces, as well as the lavish quilting by Maria to enhance it all. 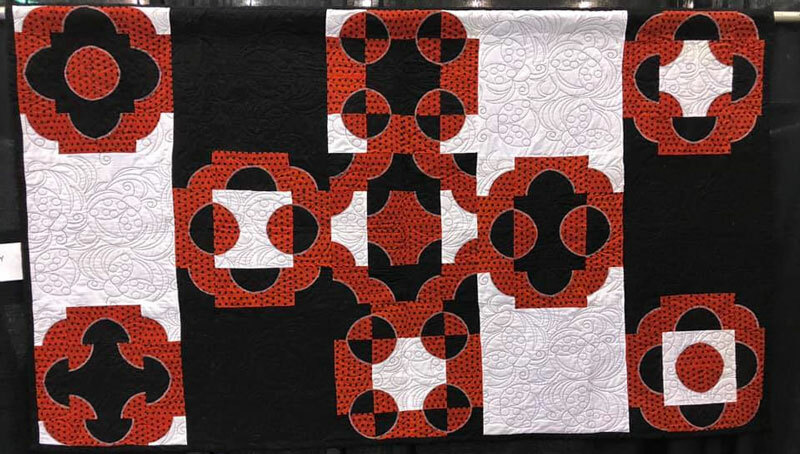 Barbara noted that she requested her triptych quilts be quilted“ as if they were cousins versus sisters.” She also noted that her husband Loren Buchanan provided design assistance! We were pleased to see that we knew several winners, customers, students and teachers who are a part of our robust class program. 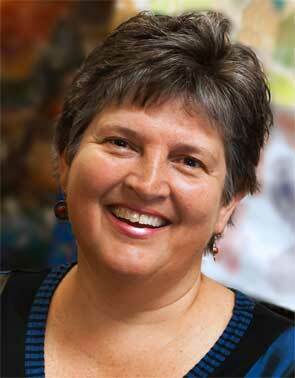 Nancy Hershberger submitted Ghost Solder 1918, a 30 in. 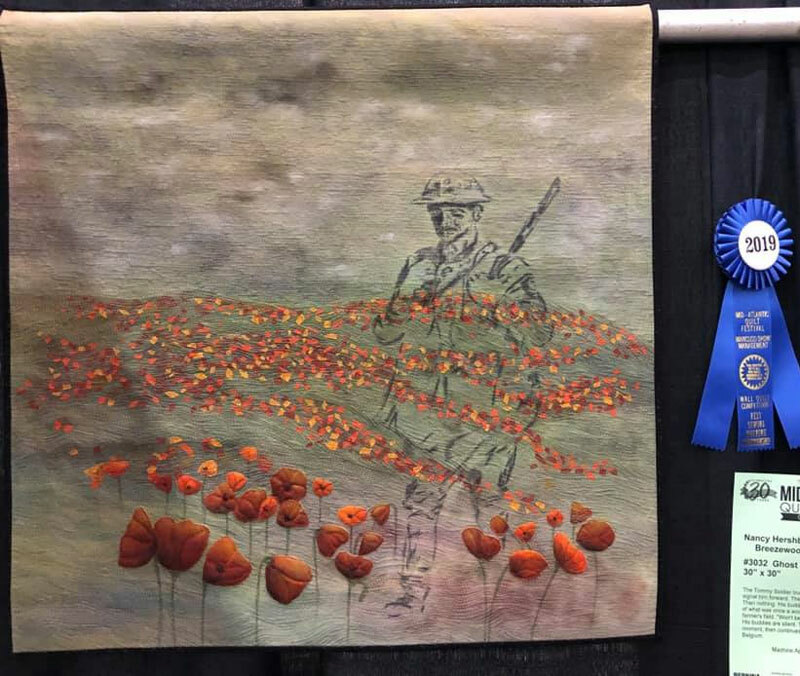 square wall quilt that was inspired by the poppy fields of Belgium — and it was awarded a blue ribbon for Best Sewing Machine Workmanship. 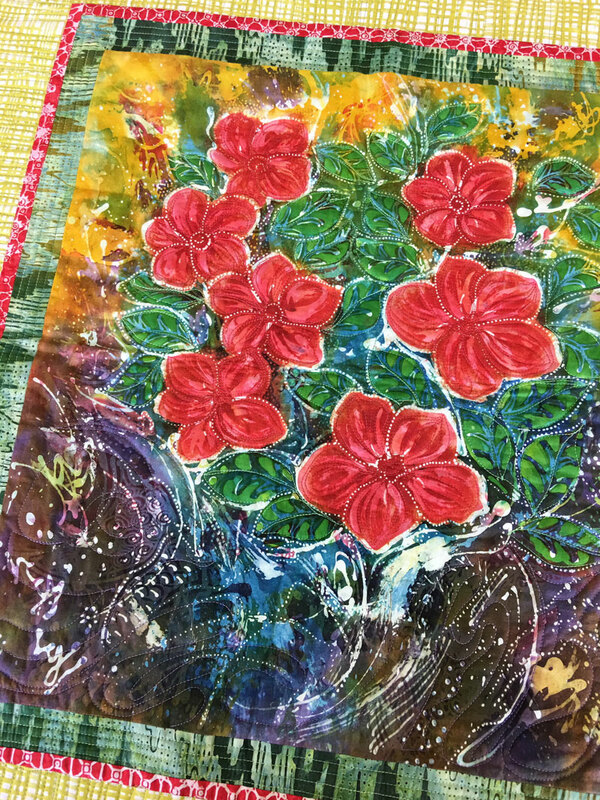 Nancy is a big fan of our Artistic Artifacts Fluid Textile Paints, and used them in this quilt! 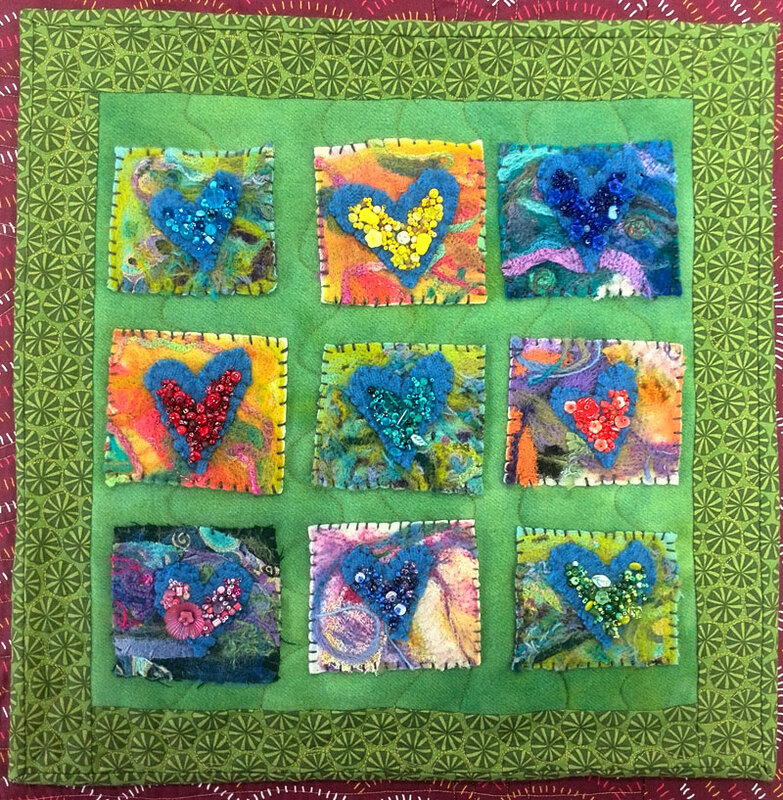 Cindy Grisdela won Best Use of Color for her quilt Confetti, pictured below, created in her trademark artful improv style. 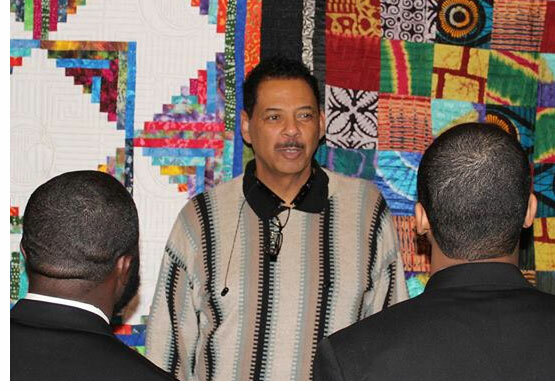 Last year while at Mid-Atlantic we shared in this blog post how much we enjoyed the special exhibit We Are Somebody, and learning more about Roy Mitchell, Jr. (pictured here center; his students’ identities are protected) and his quilting students, young men incarcerated at The Virginia Department of Juvenile Justice’s (DJJ) Bon Air Juvenile Correctional Center. Please read it if you have not yet — their story is so inspirational! 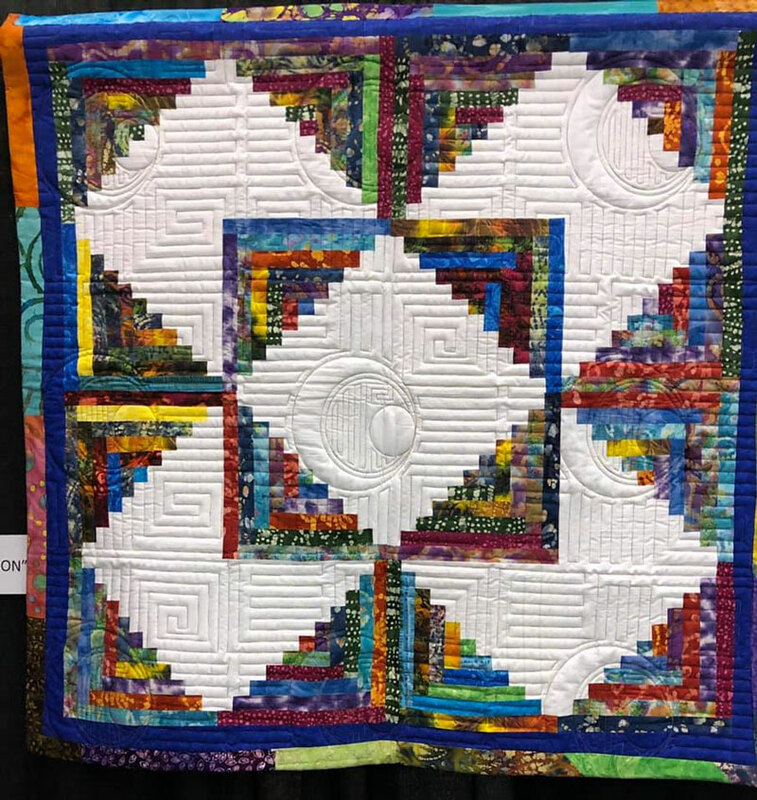 The DJJ quilting program is believed to be the only class of its type in a male juvenile corrections setting in the U.S. 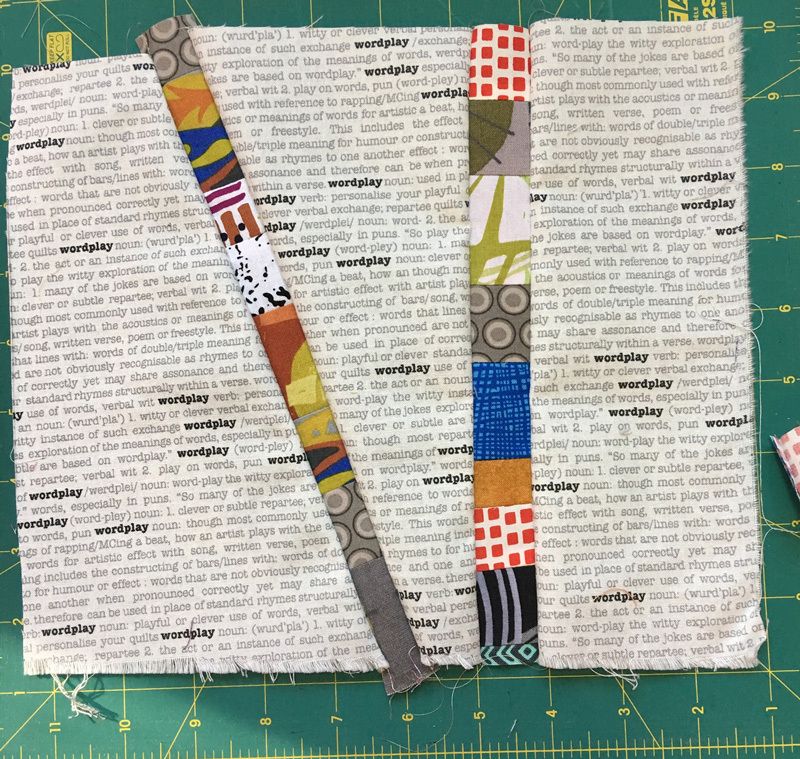 It teaches the skills involved — planning, design, measuring, geometry, sewing — and also critical life skills such as goal-setting, patience, frustration management, public speaking, and the value of precision. This year they were again featured, with “All About Us” the theme of their special exhibit. 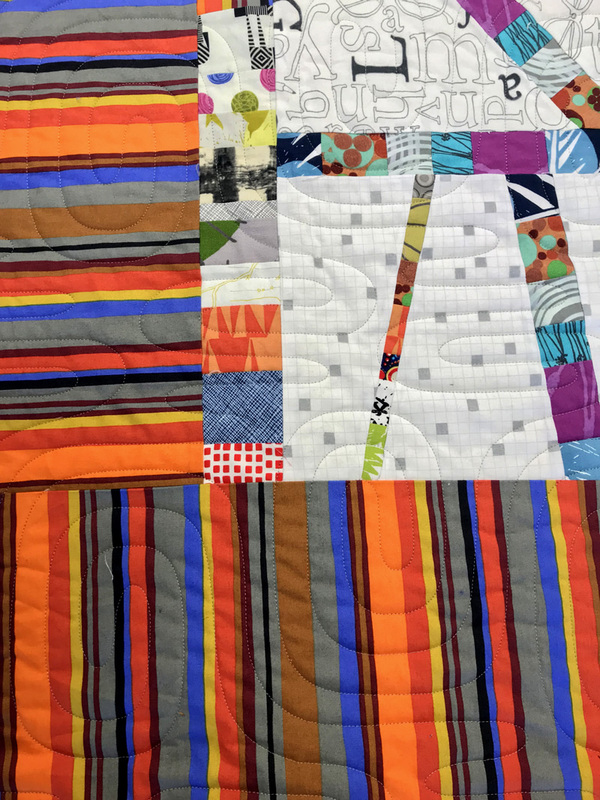 We’re delighted to share our photographs of some of these quilts, known for their amazing uses of color and design, as well as stellar workmanship! Above, A Thyme to Slant.